Sign-up for the best GG Deal! 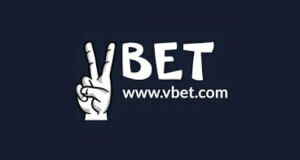 BestPoker is a poker brand of the European online gaming company BestBet Ltd. 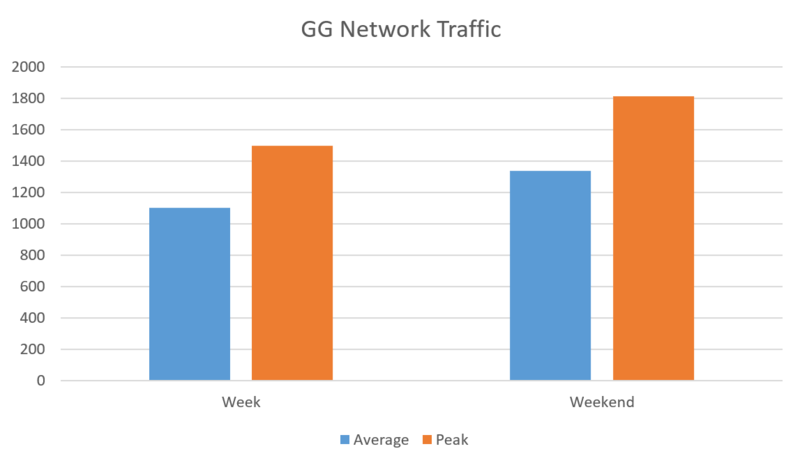 It used to be part of the Ongame network, but migrated to the fast-growing GG Network in 2016. 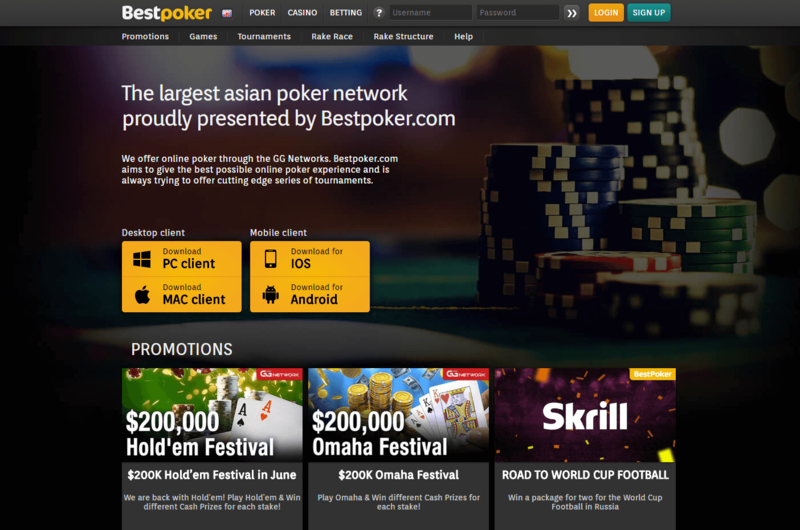 Joining other renowned EU poker rooms, on the otherwise Asian focused GG Network, BestPoker became a go-to room for many Europeans looking for soft games, great tournaments, massive promotions, and extremely low rake. Just like other GG Network rooms, the BestPoker Rakeback Deal and welcome bonus are in a league of their own. On top of that, Bestpoker often runs value-packed promotions that reward regular and new players alike. There is always loads of cash game action available at all stakes from NL10 to NL1,000. And, there is always a juicy poker tournament about to start, offering amazing prize pools and manageable fields. That’s especially true at Asian and European peak hours. As we will discuss later in this BestPoker Review, the software is really amazing as well. It not only looks great but also runs smoothly and offers some extremely useful features, such as an inbuilt staking tool. As you can see, BestPoker is without a doubt worth a try, so check out our in-depth BestPoker Review below! The following BestPoker Review was conducted by our dedicated team of poker experts with years of experience in the online poker world. BestPoker’s games and software were put to the test and scored high remarks. 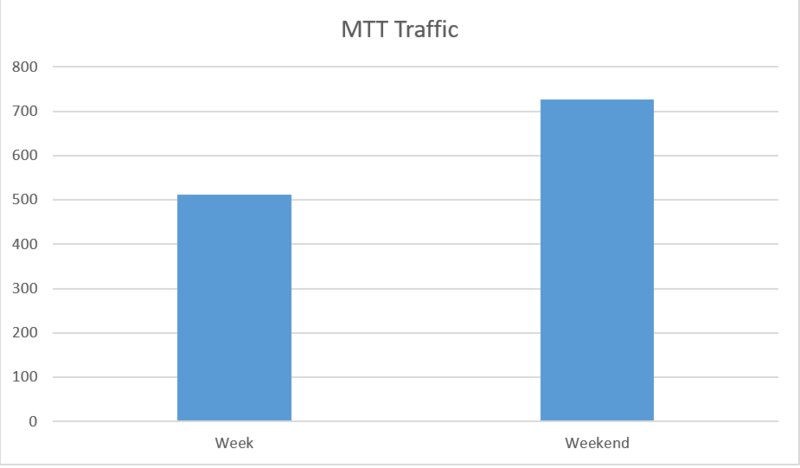 Our poker pros speak highly of the traffic as well as how soft the competition is. The rooms software is among the best and most modern online poker platforms out here. It offers multiple features that are beneficial to any online poker player, such as the built-in staking system. With a wide variety of different games and formats to choose from and enough traffic to always get a session up and running, there is not much not to like. The low rake is only complemented by the great BestPoker Rakeback Deal, which allows you to earn up to 100% RB. How to open an Account at BestPoker? 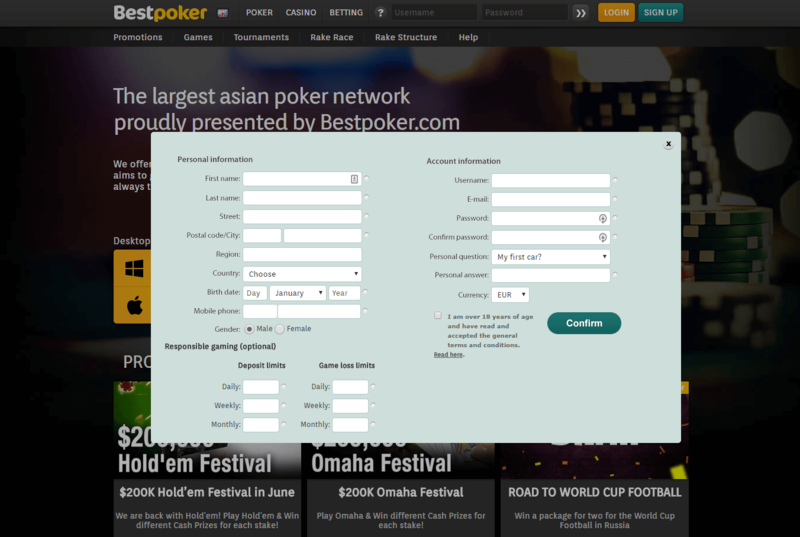 The registration process on BestPoker is as easy as they get. Nevertheless, we have put together a simple step-by-step guide that will help you get set up and claim your $2,000 welcome bonus in a matter of minutes. Please delete Cookies (important) and then CLICK HERE to get re-directed to the signup page of BestPoker. Once there, click the “SIGN UP” button in the upper right. A registration form will show up. Simply fill out all of the requested information including your personal information and account settings. Now that your account is all set up, it’s time to make your first deposit and claim the $2,000 welcome bonus. That’s done by opening the client, navigating to the cashier and choosing your preferred payment method and the amount you’d like to add to your bankroll. At the start of our BestPoker Review, we mentioned that BestPoker offers great promotions with loads of value. 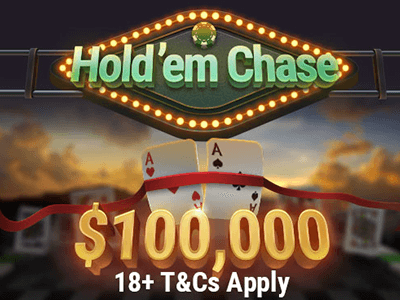 Those include a massive first deposit bonus, multiple Rake Races, and a one of a kind loyalty program as well as other thrilling events with additional prizes. On top of that, our members also enjoy the benefits of our promotions, such as our flagship promotion VIP Leaderboard and VIP Rookie Leaderboard. 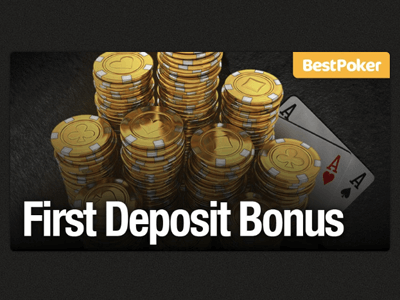 BestPoker offers a generous welcome bonus to all players making their first deposit. For every $10 you pay in rake, $1 will be released to you, up to a maximum amount of $2,000! To activate it, you need to log in to the client, go to My Bonuses, select “Welcome Bonus” and activate it. Please note that you have to clear your bonus within 90 days of making your first deposit! 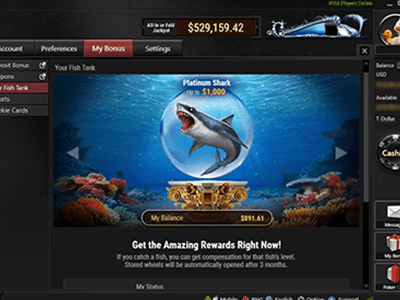 The rewards or Rakeback program on Bestpoker is known as Fish Buffet Points. Every time you generate $0,01 in rake, you earn 1 Buffet Point (FP). The more you play, the more FPs you make and faster you climb through 25 levels of the Fish Buffet. Every player starts at the Plankton level, earning approximately 15% rakeback. Each of the levels presents a unique challenge with different FP and time requirements. For more information, refer to the table below. Once you reach a new level, you will get a chance to spin a prize wheel that offers a different reward, depending on the level. If you don’t manage to earn the required amount of FPs, your FP for that level will expire and you will be demoted to the previous level. With every spin, you get a chance to win one of the 6 prizes within the prize range for your level. 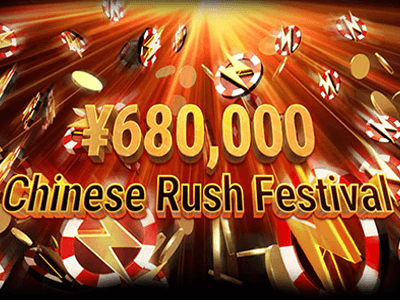 Celebrate the addition of Chinese Rush tables with the ¥680,000 Chinese Rush Festival. Simply play the fastest-paced poker game around, and generate points based on the amount you generate in rake, to win your share of ¥680,000 in April. In April, Rush & Cash will be the host to another monthly promotion: ¥888,000 Rush & Cash Chase. The $10,000 Exclusive Race prize pool will increase to $15,000 in April. Calling to all MTT grinders, jump into the tournament action on BestPoker and boost your winnings with the $100,000 MTT Race. Join the $100,000 MTT Race on BestPoker and accumulate Leaderboard points to collect your share of the prize. Join Bestpoker in April and ensure yourself a slice of the massive $100,000 All-In or Fold Festival! Note: Your rank in the leaderboard is determined by the number of All-Ins that go to showdown and the blinds it’s played at as shown below. 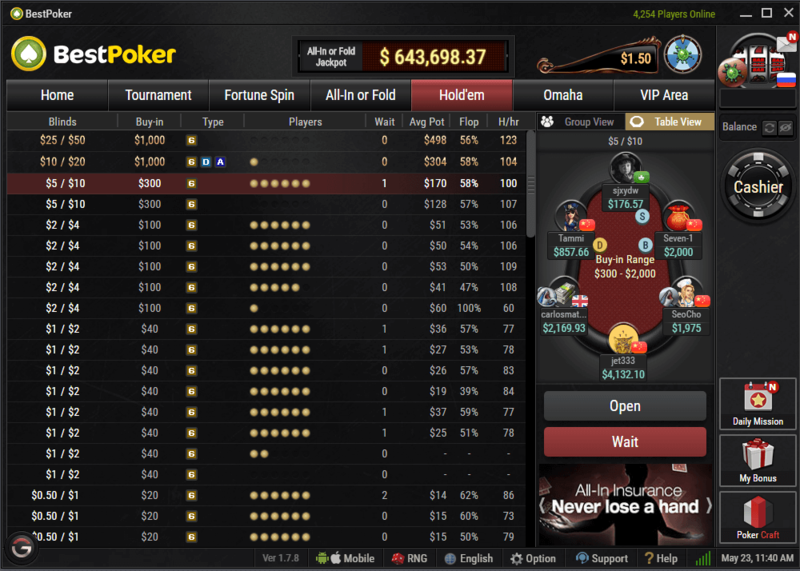 Just like other rooms on the GG Network, BestPoker runs on the software built by NSUS Ltd. The software is a favorite of many online poker players worldwide. It is well built, runs smoothly and is visually appealing. As said before in this BestPoker Review, it also offers a wide range of customization options that allow you to personalize your poker experience. Additionally, there is an in-built staking feature that allows you to buy or sell shares in any tournament and all transactions are handled automatically after the end of a tournament. BestPoker receives a high amount of traffic around the clock and offers a wide variety of games such as Texas Holdem, Pot-Limit Omaha, All in or Fold and a fantastic tournament schedule. There are multiple tables at low and mid-stakes at all times, and most of the time, you should be able to get at least a handful of tables going at the highest stakes. BestPoker players can enjoy all their favorite games on their mobile devices. The mobile poker app is extremely well designed and runs smoothly on any modern device. 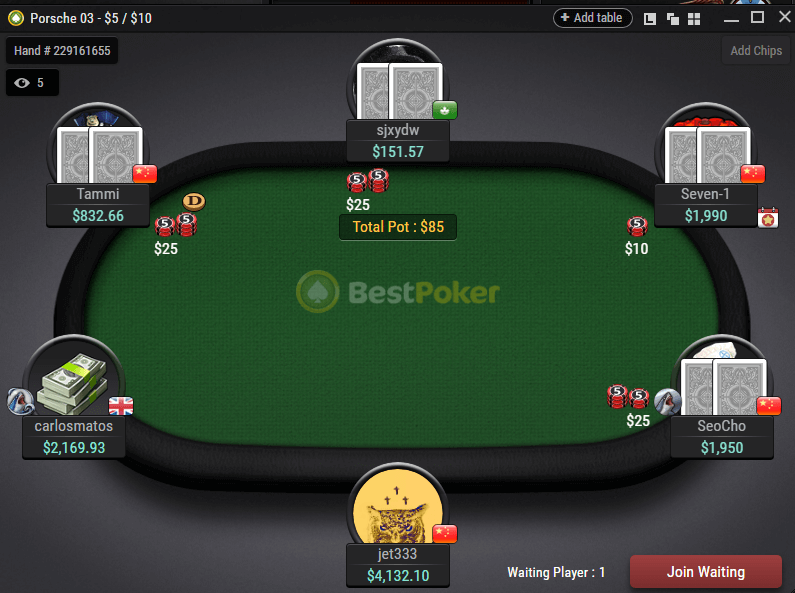 Using the new multi-table feature, players are even able to play up to four tables at once. Simply select the tables you wish to play at to start multi-tabling. Visit the BESTPOKER homepage to download the app onto your Android or iOS device. As mentioned above the BestPoker Mobile App is available for several operating systems and mobile devices such as iOS and Android. You can download the BestPoker mobile app directly from their website, but be sure to follow the device setup guide below to avoid any errors. Go to Settings and check “Unknown sources”. Enjoy your favorite games on the go. BestPoker offers a wide array of different payment options that give you all the freedom you want and need while withdrawing your bankroll or making a deposit. 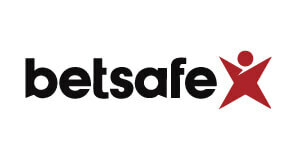 You can choose between Visa, MasterCard, Neteller, Skrill, Trustly and Bank Wire. BestPoker.com is operated by Best Global N.V. E-Commerce Park Vredenberg, Curacao with organization number and licensed in Curacao. It is a reputable online poker brand and a part of a large and stable GG Network, so you do not need to be concerned about your bankroll. Payments are processed in a timely matter and without delays. We recommend this BestPoker Rakeback Deal to all players looking for a solid online poker room with a wide selection of games and soft competition. 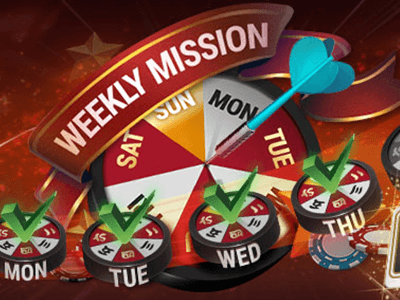 You will surely enjoy the low rake, high rakeback, and massive promotions as well as some exciting fresh approaches to your favorite games. BestPoker is eligible in the following countries: Åland Islands, Andorra, Anguilla, Antarctica, Antigua And Barbuda, Argentina, Armenia, Aruba, Ascension, Australia, Austria, Azerbaijan, Bahamas, Bangladesh, Barbados, Belarus, Benin, Bermuda, Bhutan, BoliviaBosnia And Herzegovina, Botswana, Bouvet Island, Brazil, British Indian Ocean Territory, Brunei Darussalam, Burkina Faso, Burundi, Cambodia, Cameroon, Canary Islands, Cape Verde, Cayman Islands, Central African Republic, Chad, Chile, China, Christmas Island, Cocos (keeling) Islands, Colombia, Comoros, Congo, Congo, Cook Islands, Costa Rica, CÃƒâ€te D’ivoire, Croatia, Cyprus, Czech Republic, Denmark, Diego Garcia, Djibouti, Dominica, Dominican Republic, Ecuador, Egypt, El Salvador, Equatorial Guinea, European Union, Falkland Islands, Faroe Islands, Fiji, Finland, French Guiana, French Polynesia, French Southern Territories, Gabon, Gambia, Georgia, Germany, Ghana, Gibraltar, Greenland, Grenada, Guadeloupe, Guam, Guatemala, Guernsey, Guinea, Guinea-bissau, Guyana, Haiti, Heard Island And Mcdonald Islands, Holy See (vatican City State), Honduras, Hong Kong, Hungary, Iceland, Indonesia, Iceland, Iran, Isle Of Man, Jamaica, Japan, Jersey, Kazakhstan, Kenya, Kiribaty, Korea [KP], Korea [KR], Kosovo, Kyrgyzstan, Lao, Lebanon, Lesotho, Libyan Arab Jamahiriya, Liechtenstein, Lithuania, Luxemburg, Macao, Macedonia, Madagascar, Malawi, Malaysia, Maldives, Mali, Malta, Martinique, Mauritius, Mayotte, Mexico, Micronesia, Moldova, Monaco, Mongolia, Montenegro, Montserrat, Morocco, Mazambique, Myanmar, Namibia, Nauru, Nepal, New Caledonia, New Zeland, Nicuaragua, Niger, Nigeria, Niue, Northern Maria Islands, Norway, Pakistan, Palau, Panama, Papa New Giunea, Paraguay, Peru, Pitcarin, Poland, Puerto Rico, Qatar, RÃƒâ€°union, Romania, Russian Federation, Saint Helena, Saint Kitts and Nevis, Saint Lucia, Saint Piere And Miquelon, Saint Vincent And The Grenadines, Samoa, San Marino, Sao Tome And Principe, Saudi Arabia, SaudiÃ¢â‚¬â€œIraqi neutral zone, Slovakia, Slovenia, Solomon Islands, South Africa, soviet union, Sri Lanka, Suriname, Svalbard And Jan Mayen, Swaziland, Sweden, Switzerland, Syrian Arab Republic, Taiwan, Tajikistan, Tanzania, Thailand, Timor-Ieste, Togo, tokelau, Tonga, Trinidad And Tobago, Tristan da Cunha, Turkey, Turkmenistan, Turks And Caicos Islands, Tuvalu, Uganda, Ukraine, Uruguay, Uzbekistan, Vanuatu, Venezuela, Viet Nam, Virgin Islands, US, Wallis And Futuna, Western Sahara, Zambia, Zimbabwe. BestPoker is an established online poker room that has joined the fast-growing GG Network in 2016. Just like other rooms on the GG Network, BestPoker focuses on providing a top-notch player experience, innovation, and security to its players. On top of that, it offers a state-of-art software and countless massive promotion. There is a wide selection of games to choose from and traffic is more than sufficient for even the most serious multi-tablers around. Whether you are playing Cash Games or Tournaments, Hold’em or Omaha, you will surelly enjoy evertyhing that BestPoker offers. In the following BestPoker Review, we will take a close look at the games, traffic, software and BestPoker Rakeback Deal, so lets get started! The GG Network is one of the newest and fastest growing networks in the world of online poker. 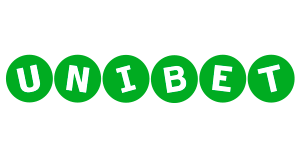 This Asian focused network is known for great games, amazing software and low rake. All that attracts more and more players to BestPoker’s tables every day. The traffic here is stable around the clock and ensures you will be able to get a session up no matter the part of the day. As it is shown above, the traffic on BestPoker rarely drops below 1000 players and stays pretty consistent around the clock. Sign up at BestPoker & Get $1000 Bonus! All games and poker accounts on BestPoker are shown in the currency you choose while making your account. And, you are able to make a deposit in almost any currency, using a wide selection of payment options mentioned in our BestPoker review. BestPoker’s Cash Games is where the majority of BestPoker’s traffic is. Players can enjoy multiple poker games with decent traffic at any limit. Stakes range from NL10 to NL5000. Just like almost anywhere, No-Limit Texas Hold’em games are the most popular on BestPoker. On average 400 players are playing NLHE games at any given time. Stakes range from NL10 to NL5k. Note that only 6-max tables are available. BestPoker also boasts a huge selection of PLO games, that are ever more popular! Stakes there range from PLO10 to PLO5000 and there is action to be found at any level! Most of the traffic is active between PLO10 and PLO100 but you can always find active tables as high as PLO5000. On average, there is 160 active players at BestPoker’s PLO tables. BestPoker doesn’t offer a fast-fold format of cash games but they do offer a variant of All-in or Fold games. Those are in essence a simplified version of Hold’em and Omaha. The only two options in AoF are, either go all-in or fold. The buy in is capped at 8 big blinds for Hold’em and 6 big blinds for Omaha respectively. 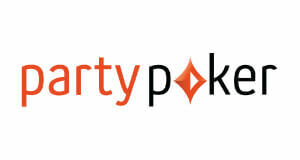 BestPoker is most widely known by its amazing MTT schedule. With big guarantees and manageable fields, it offers a great opportunity for any MTT grinder or recreational tournament player. 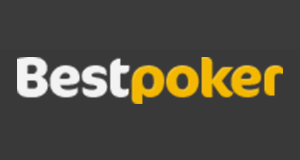 There are three tournament series that run every day of the week on BestPoker. They are called Daily Red, Daily Blue, and Daily Green. Bounty Hunters and freerolls also run all day long. Mostly the schedule does not change on the weekend but there is a $20,000 GTD Main Event on Sunday and the guaranteed prize pools of all tournaments are doubled. BestPoker offers special Tournament Builders tournaments that charge no fees and allow you to win Tournament Dollars which can then be used to buy-in to tournaments on the site. BestPoker doesn’t offer classic Sit & Go tournaments, but they do offer the popular Spin & Gos called Fortune Spin. We will go into more detail about those in the Special SNGs chapter of this brekout review. Heads-Up Sit and Gos are not yet available at BestPoker. Hyper Turbo Sit & Gos are not available yet on BestPoker. As mentioned in the earlier part of our BestPoker Review, the only SNG variant available on BestPoker are Fortune Spin & Gos. 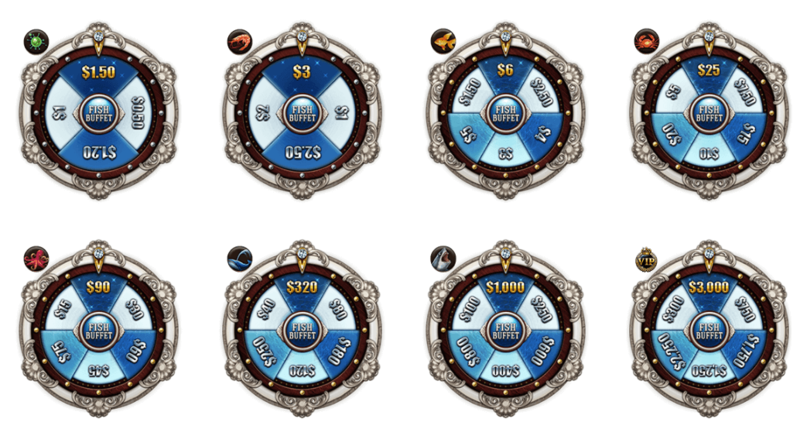 Once three players have registered The Fortune Wheel will spin. Each spin gives you the opportunity to win one of three prizes. You can win 4 or 8 times the buy-in. If the wheel stops on a Fortune Cookie, all three players receive a Fortune Cookie and the game does not get played. Inside each Fortune Cookie, there is a Cookie Card. Collect all 10 cards to earn a cash prize. BestPoker is also known by its wide selection of different freerolls that run every day and around the clock. They are called Chinese Zodiac Freerolls. The Chinese Zodiac Freeroll is a free tournament series that starts every two hours. You can win special Chinese Zodiac avatar unique to each tournament as well as a Turbo Satellite to Bounty Hunters $31.50 (first place), and a Turbo Satellite to Bounty Hunters $10.50 ticket (second and third place). 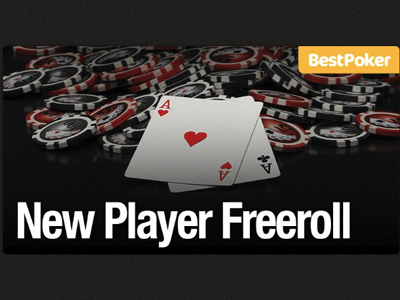 Every month for all new players on BestPoker get to play a freeroll with a guarantee of $1000! This is a great opportunity to increase your bankroll and get more opportunities for the game. All you have to do for an entry is to make a deposit of at least $10 and then you will get the ticket to participate in the tournament. 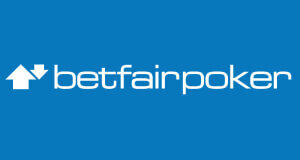 We currently don’t offer private Freerolls on BestPoker. 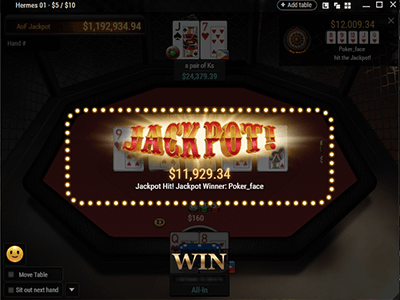 We already briefly mentioned that BestPoker uses the extremely modern and visually appealing GG Network Poker Software which will fit any poker player’s needs. The BestPoker is easy to navigate and divided into tabs that each offer all the needed info and features. You can even customize your betting shortcuts, set-up auto rebuys, and add-ons as well as the general look of the tables. It also supports a built-in staking system that allows you to buy or sell action in any tournament and the division of any winnings is done automatically. In addition to the game tabs dividing Tournaments, Fortune Spin, All-in or Fold, Hold’em and Omaha games, you can choose between a table and group view. You can also sort tournaments by format. The number of Cash Game tables you can open is not limited by the BestPoker software. Just make sure you do not open more than your device can manage. Just like with Cash Games, there is no limit to how many MTT tables you can play on at any given moment. The software offers its own Hand History and analytics tool called Poker Craft. This will give you some general information about your results but keep in mind that third-party tools like Hold’em Manager or Poker Tracker are not allowed. BestPoker offers arguably the best rake structure in the industry. Check a detailed overview below. All MTT & SNG buy-ins include a 5% fee on BestPoker. Our BestPoker’s Rakeback Deal allows you to earn up to 100% rakeback on your action. In addition to that, you can get even more value by participating in our exclusive VIP Leaderboards and other promotions. 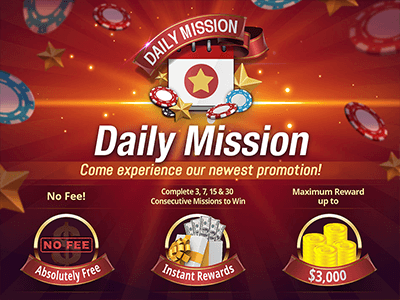 In times when most of the online poker rooms are steering away from loyalty programs and the games are getting tougher day by day, finding a room with good promotions, soft games and a good loyalty program can be a real challenge. But all that is part of the past as soon as you join BestPoker. BestPoker not only offers some of the most valuable promotions and up to 100% rakeback, but also takes care of the poker ecosystem. It caters to regulars and recreative players alike, so everyone can have a great experience, no matter what games they are playing. If that sounds too good to be true, give BestPoker a try, we are sure you will love it! 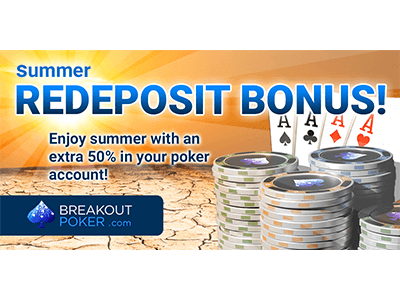 Sign up at BestPoker & Get $2000 Bonus! Submit your BestPoker Username here.